An interesting boat refit is underway at a small New Jersey boat shop. Whitecap, a 33-foot Morton Johnson sloop built in Point Pleasant, N.J., in 1924, was damaged during Hurricane Sandy in 2012 and has been sitting on land at the nearby Maritime Marina in Tuckerton, N.J., ever since. The Tuckerton Seaport museum contracted De Rouville&apos;s Boat Shop to restore the boat to her 1920s appearance, using historically authentic materials and methods. 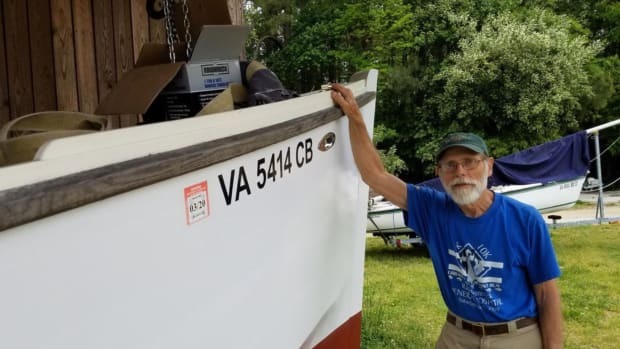 The goal is to return her to sailing condition so she can travel the Northeast and be a representative of Tuckerton Seaport and the Barnegat Bay boatbuilding tradition.